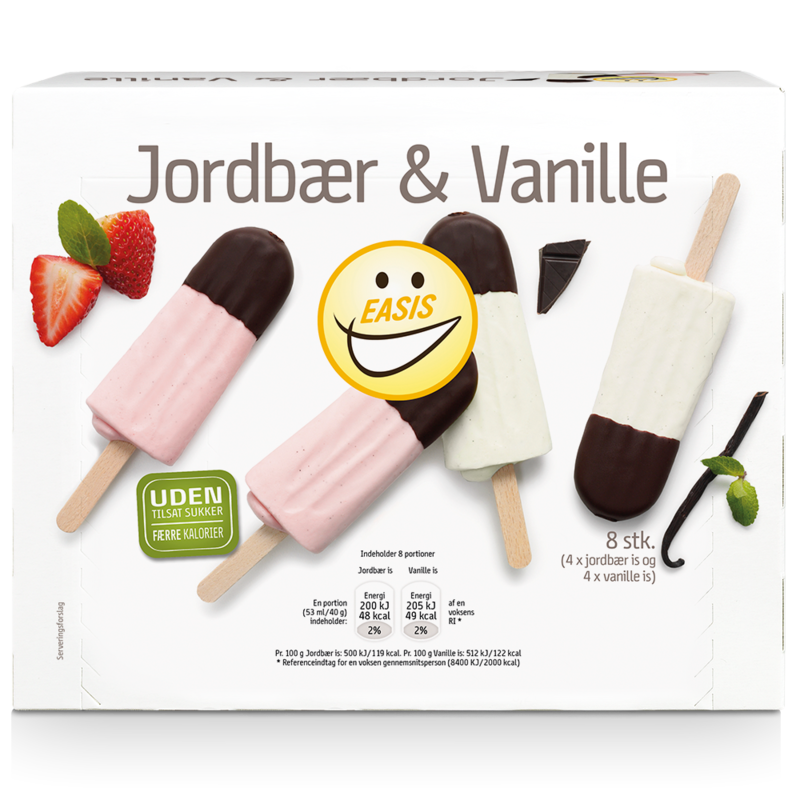 EASIS strawberry and vanilla lollies bring us the sweet taste of hot summer and cool shades. Choose the freshness of strawberry or the sweetness of vanilla. No sugar is added and they both contain 60% less calories than ordinary lollies. One lolly contains 49 calories. Strawberry ice cream: Water, bulking agent (polydextrose), sweetener (erythritol 6,8%), CREAM, skimmed MILK powder, whey powder of MILK, strawberries 2,4%, cocoa mass, dietary fibers (dextrin, inulin, oligofruktose), cocoa butter, stabilizers (guar gum, sodiumcarboxymethylcellulose, carrageenan, disodiumphosphat, locust bean gum), citrus fibers, modified potato starch, cocoa powder, emulsifiers (lactic acid esters of mono- and diglycerides of fatty acids, mono- and diglycerides of fatty acids, polyglycerolpolyricinoleat, SOY lecithin), humectant (glycerol), vegetable fat (rapeseed oil), flavours (strawberry, vanillin), colour (beet root, elderberry concentrate), acidifier (citric acid, trisodiumcitrate), vanilla seeds, salt, sweeteners (steviol glycosides, sucralose, acesulfame potassium), natural vanilla flavour. Vanilla ice cream: Water, bulking agent (polydextrose), CREAM, sweetener (erythritol 6,6%), skimmed MILK powder, whey powder of MILK, cocoa mass, dietary fibers (dextrin, inulin, oligofruktose), cocoa butter, stabilizers (guar gum, sodiumcarboxymethylcellulose, carrageenan, disodiumphosphat, locust bean gum), citrus fibers, emulsifiers (lactic acid esters of mono- and diglycerides of fatty acids, mono- and diglycerides of fatty acids, polyglycerolpolyricinoleat, SOY lecithin), cocoa powder, vegetable fat (rapeseed oil), vanilla seeds, salt, sweeteners (steviol glycosides, sucralose, acesulfame potassium), flavour (vanillin), natural vanilla flavour. Contains sweeteners. No added sugar, but with a natural content of sugar. Storage: -18° C (-4°F) or colder. Do not refreeze after thawing. Net content: 8 x 40 g (8 pcs). Net volume: 320 g (8 x 53 ml). Colli size: 5 x 8 pcs.